How to avoid harlotry (Leviticus 21:14)? By confining fornication within the confines of the Godly Marriage (Matthew 19:5)! How to avoid premarital loss of menstruation and hymenal penetration? By studying the Bible for advice. One of the most uplifting stories ever told is the story of Isaac and Rebecca. 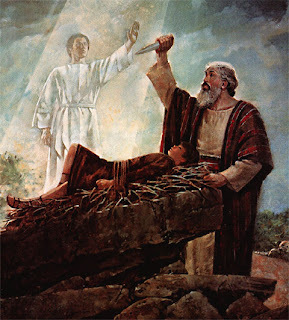 Isaac had a nasty childhood that included death threats from God (Genesis 22:2). But God compensated for any resulting psychological trauma by giving Isaac a partner in fornication: Rebecca. The manly man saw an attractive young girl by the well and the rest is History: Jacob, Esau whom God hated with all His Spiritual Guts (Malachi 1:3; Romans 9:13), Exodus, Moses, Jesus and finally our own Landover Baptist Church to carry on the Immaculate Torch of Godliness. While the Real Bible is not too detailed regarding the marriage of Isaac, we know that he took Rebekah (or Rebecca) and penetrated her as everydecent husband who tolerates the command of multiplying (Genesis 1:28) does despite the repulsive nature of the marital act. OK. Now, what about Rebecca’s age!? Here we must refer to Jasher, but that is totally acceptable as the Bible accepts it as a reliable source of history. The Bible would never ever promote anything that wasn’t Good in the eyes of Jesus! And they all blessed the Lord who brought this about, and they gave him, Rebecca, the daughter of Bethuel, for a wife for Isaac. 40. And the young woman was of very comely appearance, she was a virgin, and Rebecca was ten years old in those days. 41. And Bethuel and Laban and his children made a feast on that night, and Eliezer and his men came and ate and drank and rejoiced there on that night. 44. And Isaac took Rebecca and she became his wife, and he brought her into the tent. 45. And Isaac was forty years old when he took Rebecca, the daughter of his uncle Bethuel, for a wife. Ten! Problem solved! A Biblically suitable age to marry and start begetting during the age of the patriarchs! But there is more. The matters of the Jews are obscure and sometimes the Jews themselves know best what they did in the ancient times. In Medieval times, the Rabbis calculated that Rebecca would have been three years of age when she married Isaac (and they did consummate the marriage, as Genesis 24:67 proves beyond anydoubt whatsoever)! Isaac was 37 when Rebecca was born and 40 when he took her in that tent. That means that Rebecca could have been 3. Thus, our Sacred Texts prove us that she was between 3 and 10 when Isaac took her with absolute certainty! Because of the Jasher connection, less certain than Balaam’s donkey (Numbers 22:28) but much more certain than the existence of the planet Uranus. That was then, this is now. We obey the secular law of the land (Romans 13:1-2) and wait for Jesus to dismantle this Earth that has forgotten the Fear of God (Ecclesiastes 12:13) and many other proud Biblical traditions. To give you some insight, there are countries that still somewhat follow the Patriarchal code of marrigeable age. Taoist-Confusionist-whatever countries do the worst: Singapore 21!